It is clear upon entering Fuku-san's room that he is a video games fan, from the two game posters he has stuck up on his wall. 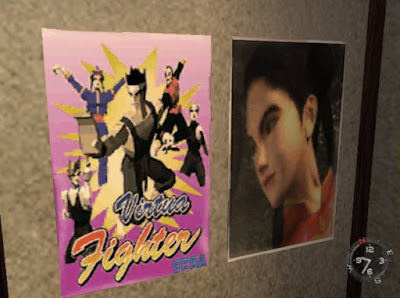 The first poster shows a promotional image for Virtua Fighter, which looks to be the Sega Saturn version - Akira's hands are rendered in a chunky block style (as compared to the arcade version where he has individual moving fingers). Right: but not so for Akira in the Saturn version, who has blocky hands. The poster next to that on the wall is a CG image of Pai Chan, one of the characters that appears in the game. 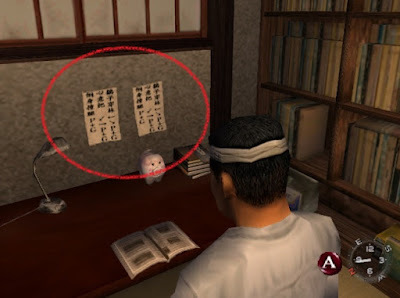 Turning our attention to the far wall, a couple of smaller notes or notices on the wall can be seen above his desk. 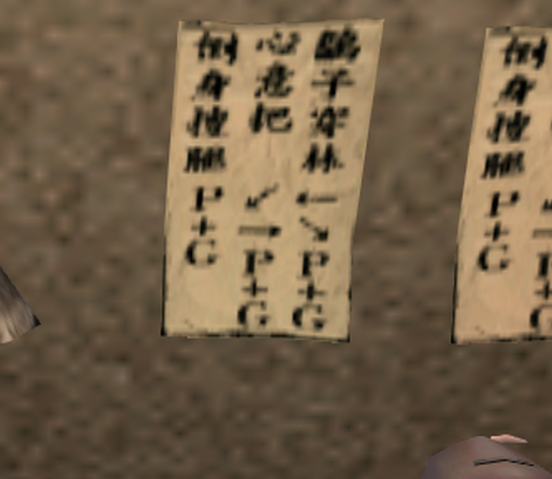 They contain some sort of hand-writing in Japanese with arrows and the letters "P+G". The notes are obviously important to him, as there is not just one but two which are identical. Furthermore, they are positioned right at eye-height for easy review when he sits down to study. The two cryptic notes on the wall in front of Fuku-san. But the meaning of these notes had me stumped for a while. I wasn't able to find out much information about the Japanese words written there, and assumed these might be related to his studies - perhaps his own martial arts training. After some more time spent pondering and investigating further I finally tracked down what they are. 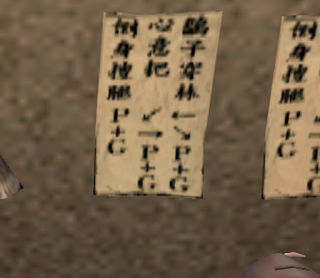 I eventually realized they simply represent notes Fuku-san has written to to help himself memorize how to perform three fighting moves (specifically, throws) for the character of Akira in Virtua Fighter. 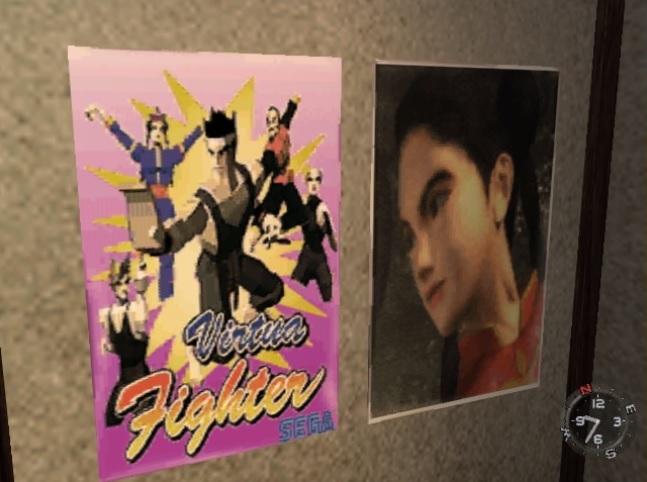 No doubt the "P+G" annotations - coupled with the Virtua Fighter posters - are plain-enough hints as to the meaning for experts at Virtua Fighter, but I was still happy to resolve it. Once I understood the meaning of the notes, I couldn't help smiling as it seems so typical of Fuku-san's somewhat goofy character - he has even put up the note twice, side-by-side, as if this will help it stick in his mind better. It also serves to further emphasize the contrasting worlds of Fuku-san and Ryo: while the happy-go-lucky Fuku-san works on polishing his gaming skills, Ryo is searching for the man who has murdered his father. is this from shenmue 1 or 2? I've now tagged it with the Shenmue 1 category. :-) For people who haven't experienced the first two games yet, hopefully Sega will be putting out HD remasters - currently they are "investigating" it. Haha, there's a lot to love about it! Hahaha that revelation! I believe they kept two identical copies side-by-side for aesthetic purpose. Considering the screen resolution were not so big at that time, it makes the document more catchy to the eye. 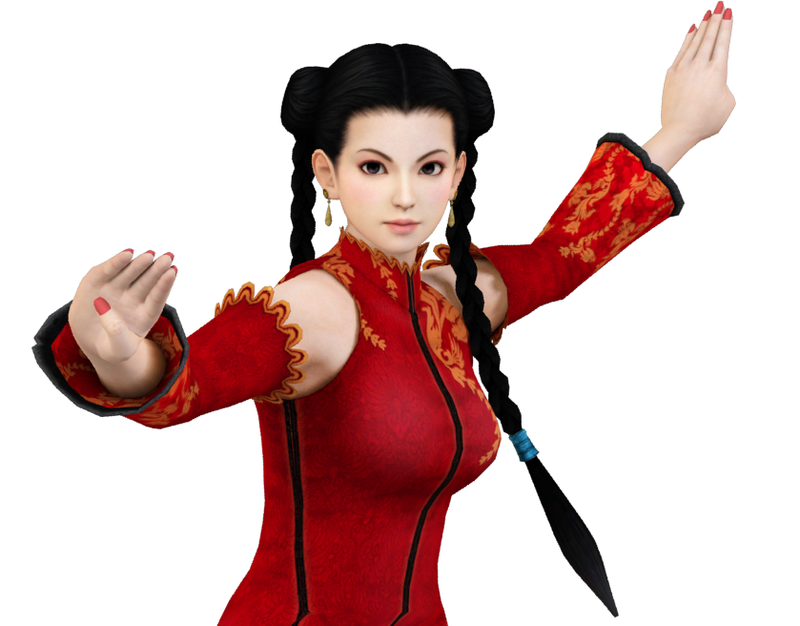 It may have had other fight moves as well if they had enough place to add a second texture.